Other Family Data Children: Mozelle (b. 1875; d. 1915), Juliet Florence Toledano (b. 1884; d. 1968), Joseph Edgar Joseph (2A5) and Felix Alexander Joseph (b. April 29, 1890, HK; d. September 30, 1949, Egham, UK). A twin brother to Juliet Florence may have died in childbirth. He was the ninth of ten siblings (five brothers and four sisters) that included Manasseh Abdulla Joseph (2E4). His father was the brother of Farha Hyeem, the second wife of David Sassoon. Historical The Josephs lived at Stonehaven, which was located approximately at 63 Robinson Road. Daughter Juliet Florence married Teofilo Toledano, younger son of Amadeo and Mary Toledano of Leghorn, Italy, in Ohel Leah Synagogue on March 29, 1908. Juliet and Teofilo’s names can be found on the Toledano family tree – Giuseppe ben Abraham branch. According to a biography written about him in the book, Gibeath Saul, Saul moved to India when he was 18. At that time, he was already a good Hebrew scholar and had some knowledge of French and English. In Bombay, he attended the David Sassoon School in order to improve his English. He subsequently joined the firm of David Sassoon, Sons & Co. 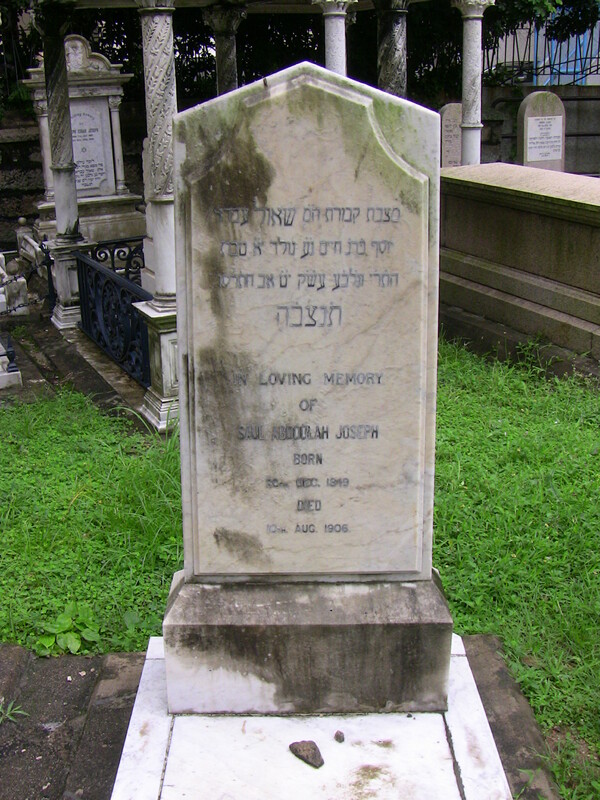 In 1872, he married Sophia Gubbay, who was the sister of Leah Gubbay (the mother of Jacob Sassoon and the Leah of Ohel Leah Synagogue). In 1875, he became the agent for David Sassoon in Foochow (Fuzhou), China, but left the company and returned to India three years later where he ran his own company. He did not do well in that venture, so in 1882 he and his family moved to Hong Kong where he became a successful exchange broker. He was reputed to be a keen student of oriental languages and an Arabic scholar. His knowledge of the Koran in Arabic was often acknowledged by learned Muslims as being more profound than theirs.